In 2017, about a quarter of the county's population (estimated 8,600) was Swiss Amish. The statute that mandated creation of this county was passed on February 7, 1835, and the organization itself was authorized on March 1, 1836. Its name honors the sixth President of the United States, John Quincy Adams. Selection of the county seat was finalized on 18 May of that year. The first non-Native settlers arrived in what is now Adams County in 1835, encouraged by the new Erie Canal and by the end of the Black Hawk War. They consisted entirely of settlers from New England. These were "Yankee" settlers, that is to say they were descended from the English Puritans who settled New England in the colonial era. They were primarily members of the Congregational Church though due to the Second Great Awakening many of them had converted to Methodism and some had become Baptists before coming to what is now Adams County. The Congregational Church subsequently has gone through many divisions and some factions are now known as the Church of Christ and the United Church of Christ. When these settlers arrived they found dense forest and wild prairie. The first Amish settlers arrived in 1840; most came directly from Switzerland, preserving their Bernese German dialect, not adopting the Pennsylvania German dialect of the majority of the Amish. The Yankee settlers commissioned the first courthouse in 1839, a two-story frame building. The log-building jail was completed in 1837. The present Adams County courthouse was built in Decatur in 1872–1873 at a cost of $78,979. [n 1] The designer was J. C. Johnson, who had been trained as a carpenter and joiner and became a self-taught architect; he won second place in the Indiana State Capitol design competition. The construction was done by Christian Boseker of Fort Wayne. It is built of red brick with stone ornamentation. The Amish (Swiss Amish) community in Adams County, whose antecedents trace to 1840, speak a Bernese dialect in everyday life. They had a total population of 8,595 people in 58 congregations in 2017, or 24.2% of the county's population. Indiana State Road 124 runs east–west through the county, from Bluffton in Wells County through Monroe and on to the Ohio border. Indiana State Road 101 runs south–north, from State Road 124 near the Ohio border, through Pleasant Mills and Rivare, to Allen County. Indiana State Road 116 runs west–east across the county, from Bluffton southeast to Linn Grove, south to Perryville, then east to a terminus at U.S. Route 27 in Geneva. Indiana State Road 218 runs west–east across the southern end of the county, passing through Berne. CSX Transportation operates a rail line from Decatur, running northwest toward Fort Wayne. A Board of Commissioners forms the county's executive body. They are elected county-wide, in staggered four–year terms. One commissioner serves as Board President. This board executes the acts of the council, causes necessary revenues to be collected, and manages day-to-day functions of the county government. The county maintains a small claims court. This court's judge is elected to a term of four years and must be a member of the Indiana Bar Association. The judge is assisted by a constable who is elected to a four-year term. In some cases, court decisions can be appealed to the state level circuit court. The county has other elected offices, including sheriff, coroner, auditor, treasurer, recorder, surveyor and circuit court clerk. Each of these serves a term of four years and oversees a different part of county government. Members elected to county government positions are required to declare party affiliations and be residents of the county. Each township has a trustee who administers rural fire protection and ambulance service, provides poor relief, and manages cemetery care. The trustee is assisted by a three-member township board. The trustees and board members are elected to four-year terms. Public schools in Adams County are administered by three public entities: North Adams Community Schools; Adams Central Community Schools; and South Adams Schools. The Diocese of Fort Wayne and Lutheran Schools of Indiana both operate in Adams County as well. In all, these organizations operate 13 schools in the county. Gene Stratton-Porter (1863 – 1924), author, nature photographer, naturalist, and silent movie-era producer, lived in Decatur and Geneva 1886–1913. Director David Anspaugh (born 1946), who directed the movies Hoosiers and Rudy, was bor in Decatur. Sculptor David Smith (1906 – 1965) was born in Decatur. ^ A $79,000 capital expense in 1872 would be roughly equivalent to $18,900,000 in 2010. 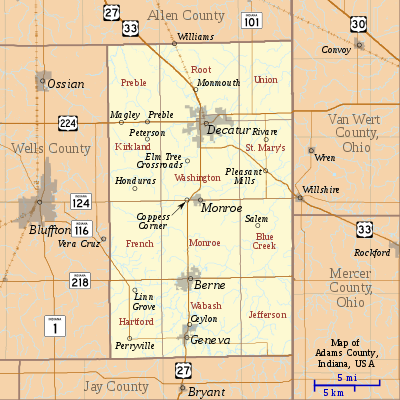 ^ "QuickFacts: Adams County, Indiana". U.S. Census Bureau. 2018. Retrieved April 18, 2018. ^ "EPA County FIPS Code Listing". EPA.gov. Retrieved August 12, 2018. ^ a b "Adams County QuickFacts". United States Census Bureau. Archived from the original on July 6, 2011. Retrieved September 17, 2011. ^ a b c d "DP-1 Profile of General Population and Housing Characteristics: 2010 Demographic Profile Data". United States Census Bureau. Retrieved July 10, 2015. ^ "Adams". Indiana Township Association. Retrieved October 10, 2011. ^ "Indiana Transportation Map 2009–2010" (PDF). Indiana Department of Transportation. 2009. Archived from the original (PDF) on December 15, 2010. Retrieved December 16, 2010. ^ a b "State of Indiana 2011 Rail System Map" (PDF). Indiana Department of Transportation. 2011. Archived from the original (PDF) on June 15, 2011. Retrieved June 19, 2011. ^ Baker, Ronald L.; Carmony, Marvin (1975). Indiana Place Names. Bloomington, Indiana: Indiana University Press. p. 1. ^ Goodrich, De Witt Clinton; Tuttle, Charles Richard (1875). An Illustrated History of the State of Indiana. Indianapolis: R. S. Peale & Co. pp. 549–550. ^ Snow 1907, p. 83. ^ Counts, Will; Jon Dilts (1991). The 92 Magnificent Indiana Courthouses. Bloomington, Indiana: Indiana University Press. pp. 8–9. ISBN 978-0-253-33638-5. ^ a b "Monthly Averages for Decatur, Indiana". The Weather Channel. Retrieved January 27, 2011. ^ "Köppen Climate Classification for the Conterminous United States". Idaho State Climate Services. Archived from the original on September 30, 2009. Retrieved January 23, 2011. ^ "Selected Social Characteristics in the United States – 2006-2010 American Community Survey 5-Year Estimates". United States Census Bureau. Retrieved July 10, 2015. ^ "Selected Economic Characteristics – 2006-2010 American Community Survey 5-Year Estimates". United States Census Bureau. Retrieved July 10, 2015. ^ "U.S. Route 27". Highway Explorer. Archived from the original on October 15, 2012. Retrieved October 12, 2011. ^ "U.S. Route 33". Highway Explorer. Archived from the original on October 7, 2011. Retrieved October 12, 2011. ^ "U.S. Route 224". Highway Explorer. Archived from the original on October 13, 2012. Retrieved October 12, 2011. ^ "State Road 124". Highway Explorer. Archived from the original on March 24, 2012. Retrieved October 12, 2011. ^ "State Road 101". Highway Explorer. Archived from the original on October 7, 2011. Retrieved October 12, 2011. ^ "State Road 116". Highway Explorer. Archived from the original on March 24, 2012. Retrieved October 12, 2011. ^ "State Road 218". Highway Explorer. Archived from the original on October 7, 2011. Retrieved October 12, 2011. ^ a b Indiana Code. "Title 36, Article 2, Section 3". Government of Indiana. Archived from the original on October 5, 2008. Retrieved September 16, 2008. ^ a b c d Indiana Code. "Title 2, Article 10, Section 2" (PDF). Government of Indiana. Archived (PDF) from the original on October 29, 2008. Retrieved September 16, 2008. ^ State of Indiana Department of Local Government Finance. "2010 Budget Order (Adams County, Indiana)" (PDF). Archived from the original (PDF) on September 17, 2010. Retrieved September 19, 2010. ^ Leip, David. "Dave Leip's Atlas of U.S. Presidential Elections". uselectionatlas.org. Retrieved May 14, 2018. ^ "DOE Compass". Indiana Department of Education. Retrieved October 10, 2011. ^ "Richard R. Schrock - Autobiography". Nobelprize.org. Retrieved October 11, 2011. ^ "Overview for David Anspaugh". Turner Classic Movies. Retrieved October 11, 2011. ^ "David Smith chronology". David Smith Estate. Archived from the original on October 11, 2011. Retrieved October 11, 2011. Snow, J. F. (1907). Snow's History of Adams County, Indiana. Indianapolis: B. F. Bowen & Co.
Tyndall, John W.; Lesh, O. E., eds. (1918). Standard History of Adams and Wells Counties, Indiana. 1. Chicago and New York: The Lewis Publishing Co.
Tyndall, John W.; Lesh, O. E., eds. (1918). Standard History of Adams and Wells Counties, Indiana. 2. Chicago and New York: The Lewis Publishing Co.